maybe a little too clean, haha. the cleaners they used have a strong smell. nothing open windows couldn't cure, but I imagine if it was raining or cold outside, that might present a proble. other than that, staff was friendly, room was clean and decent size. located literally right next to a metro stop. Nice room, friendly and helpful staff. Metro entrance 5 meters from the front door! Nice neighborhood too. A grocery directly across the street, 2 bakery/patisseries within 5 minutes walk, 5 minute walk from the fabulous 4 Luminaires restaurant. Stayed for one week and would go back again. Room in back of hotel which was extremely quiet and had a nice view. Did not have room cleaned every day to minimize chemical smell other reviews noted. But when room was cleaned it was done well - kept windows open to air out room. Stayed there during heat wave(40 c) and was not to terrible with fan in room, drapes closed and windows open. 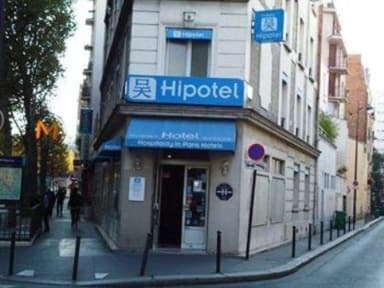 Great place to stay on a budget in Paris. 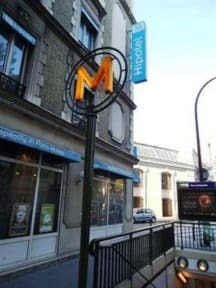 (+) Metro is right in front of the hostel. Very convenient. 20 mins to Eiffel Tower area by metro. 60 mins from the Airport CDG by train RER B & Metro. Small grocery store opposite, 5 mins walk to McDonalds, Tabac & Chinese, Japanese, French bistros. (-) I emailed to ask for 2 days earlier left luggage but hadn't received any response. Poor communication. Nice little area of Paris. Originally felt a little far out of the way, but once you figure out the train system, which takes no time at all, you are only 2 or 3 stops from wherever you need to go. Would recommend to friends and family! It was exactly what we expected, nice, clean and value for money. It was noisy, if the window was open, as it was facing a busy road, but that did not bother us at all. Pros - Nearby Metro Station for easy access. Take Exit 3 at Porte de Bagnolet. - Departmental Store just across the road open 8AM-10PM if you are looking for water/fruits etc. - Place Gambetta nearby for restaurant etc. - Room was good - You can keep your luggage & Use common washroom till you have a room Cons - No Safe in Room - Bathroom less spacious. - Hostelworld says the checkin time as 2:00PM whereas its actually 2:30PM - Took 10 Euro extra. The location right next to the metro station is fantastically convenient! With that, however, is the frustrating volume of noise coming from the street. It's far too hot to not have the windows open during the summer and even the fall, but the noise from the street is impressively loud throughout the entire night. The lack of security worried me, seeing as there was no verification process for obtaining our room key. That's an easy fix, and hopefully they do so soon. Overall, decent place.